LEGO Star Wars Forum | From Bricks To Bothans • View topic - [MOC] YT-2001 - S 04 Light Freighter "Night Shadow"
[MOC] YT-2001 - S 04 Light Freighter "Night Shadow"
When the Rebrick contest was announced i was very excited to enter, more so because you get to design your own YT design, a day or so after the contest went up i started drawing my concepts. As you can see the final design it's basiclly a rotated Falcon design, the docking tube is now on the back, instead of having two it has one with the cockpit on it, i moved the engines and added two more and so on. Now i had to build it... and that's were the fun began ! So i proudly present you *drums play* the Night Shadow. Equipped with a dual new generation SRB45 sublight engine & 2 ion engines: "She's so fast you won't be able to see her shadow". With heavy canons and turrets she has more that your avarage light freighter. -This build was heavily inspired by the brilliant new UCS Falcon and Marshall Banana's legendary MOC, since they're the ultimate renditions of the YT-1300 in my opinion, it only made sense to me to base this model after those, plus it gives it the messy Corellian Freighter look i was going for. - I went for a UCS/minifig scale to add as much detail as possible. 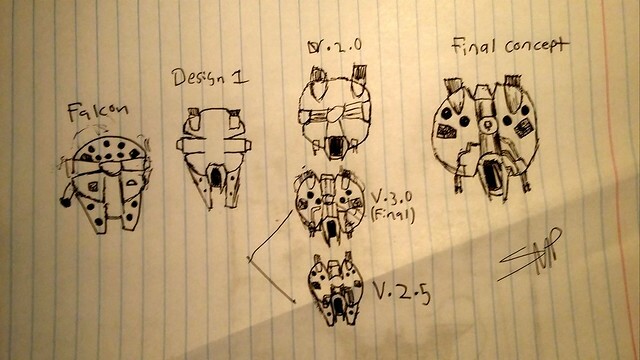 -I came up with the design after 3 attemps (as seen on the drawings), it was inspired by the YV-560, YT-1300, YT-2400, The Phantom and a hamburger. 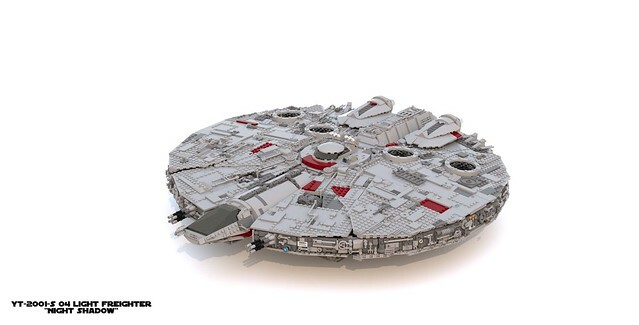 -I wanted to give it the kitbashed look that the Falcon has, since they used that technique on the actual prop, i used a variety of pieces for this, from tiles to minifig accesories, have fun looking at the greebling ! -It took me about 3 weeks to finish this ship, from the concept art to the final renders. -This model has 3980 pieces and was built on LDD and rendered on Bluerender (since i didn't have the money to build this). 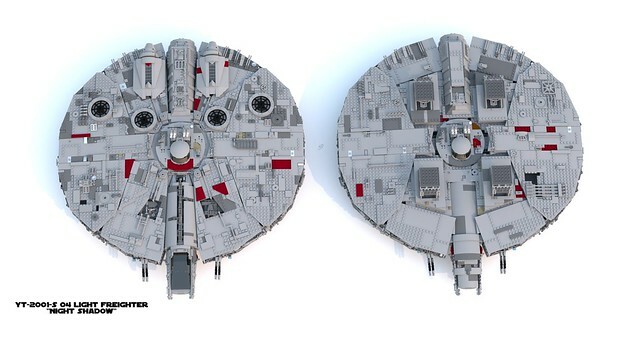 -This model is ment to be in scale with minifigs & the new UCS Falcon. So there ya go ! I hope you all like it, if you do or don't please leave your thoughts ! I am more than happy to recieve feedback. 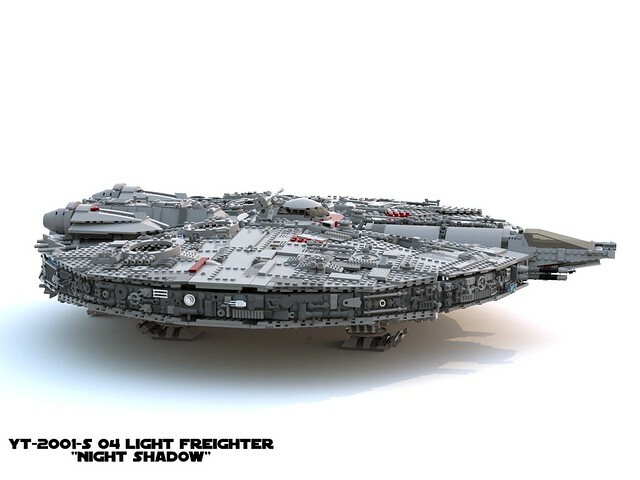 Re: [MOC] YT-2001 - S 04 Light Freighter "Night Shadow"
I like it! 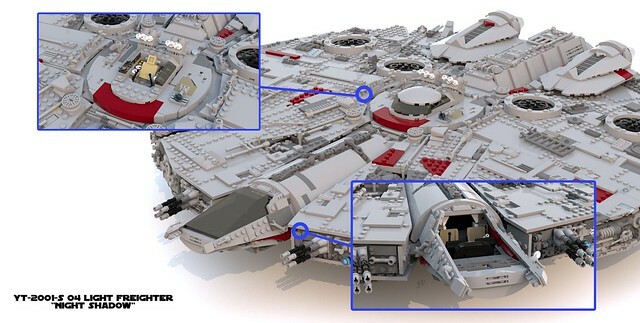 Somewhat simpler than the falcon design-wise, but it definitely still says Corellian freighter. I like the aesthetic of the aft mounted docking ring too, along with the extra engines.